St Helena Island SC in Beaufort County South Carolina is one of the loveliest Sea Islands along the eastern coast and is becoming very popular among South Carolina attractions. It is only about a 10-15 minute drive from downtown Beaufort SC, but compared to many neighboring islands it can still be considered a largely undeveloped paradise. 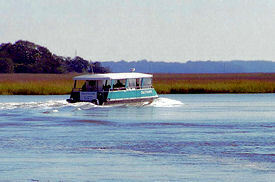 The island is bordered on one end by the Town of Beaufort. At another end of St Helena Island are Harbor and Fripp Islands. This location has proved beneficial for the Town of St Helena. The outlying resorts attract more visitors. The road to Fripp or Harbor Island means a drive through St Helena Island first, and many tourists are now making this low key island a day stop along the way. On this island you have winding roads that are lined with enormous live oaks. The spreading canopy of branches is so thick in some areas that it blocks the sun completely. One of the main drags is known as Lands End Road. If your follow this winding, two lane road you can find the ruins of Fort Fremont, Battery Fornance and Battery Jessup which date back to the Spanish American War. History buffs are especially attracted to this area of St Helena Island SC. 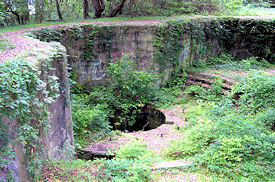 The Batteries once were equipped with large cannons affixed to platforms that could be raised and lowered. These devices allowed the soldiers to fire at enemy ships and protect themselves and the cannons. If you have always wanted to visit the Outback, you might find enough adventure outdoors on St Helena Island SC. There are deer, wild boars and alligators on the island. Most of these animals stick to the much less populated regions but you will see signs that encourage you to watch out for them while driving. Nature lovers will find an abundance of native plants and wildlife that are both rare and interesting. There is even quicksand located in numerous areas, but signs are up to keep you out of trouble. A uniquely different phenomenon that you may want to look for is a ghostly apparition known as the Lands End Lights. Many people swear that they have seen them. 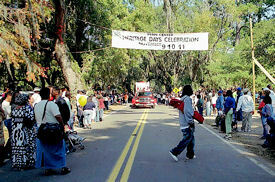 St Helena Island SC is closely identified with the Gullah heritage. 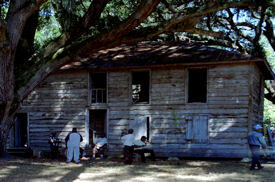 It provides a unique opportunity for tourists to learn more about the distinctive Gullah culture, Gullah history and Gullah people. One of the reasons that the Gullah culture was able to thrive on this small island was because of the relative isolation from the mainland. There was not a bridge linking St Helena Island to Beaufort South Carolina until the 1920s, and before this travel was by ferry, small boats or a raft. The famous spiritual Michael, Row the Boat Ashore was a song used by the black men rowing the ferry across Port Royal Sound. It became popular when missionaries and others wrote down the words and melody and began to use it. The lilting patois and colorful words used by the Gullah community can sometimes be difficult for outsiders to understand but fascinating to hear spoken. The Gullah people have been able to transform crafts like caning; basket weaving and net making into true art forms. Because so many younger people have had to abandon these types of occupations educators and historians are now hard at work trying to keep the Gullah culture and traditions from dying out. When you visit St Helena Island you can find exquisite baskets that have been woven from sweet-grass or nets that have been meticulously crafted to perfection. 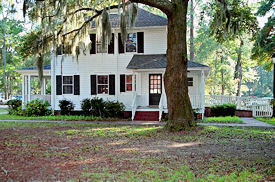 One of the landmarks that must be visited when touring St Helena Island SC is Penn Center. Here you can learn about Gullah history. This is also the first school for freed slaves. Today it is honored as one of the countrys National Historical Landmarks and one of the most significant African American cultural institutions in existence. Prior to the end of the Civil War there were former slaves who had been given their freedom. In the early 1860s these people wanted to make their own way in life, but most had no education, land or money. Laura Towne was assigned to build a school for freed slaves on St Helena Island and was soon joined by Elen Murray. The two women founded Penn Normal School on Oaks Plantation in 1862. At first the idea was just to provide training in farming and agricultural pursuits. It was not very long before the school added trade skills to the curriculum. Carpentry classes, blacksmith training, wheelwright instruction, harness making, basic mechanics, basket weaving and cobbling were soon being taught to the students. Many of these skills were being taught by former slaves. 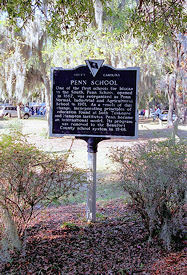 The school changed its name to Penn Normal Industrial and Agricultural School to reflect its new identity and mission. Today the Penn Center is active in programs which maintain the historical importance and the rich cultural heritage of the Sea Islands and Low Country African American culture. These cultural centered educational programs incorporate Gullah culture, Gullah history and customs. There is a concentration of four programs which are Child Development Center, After School Sessions, Summer Enrichment Camps and Teen Leadership Institute. 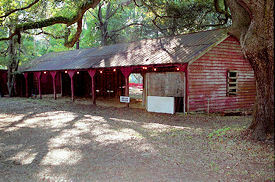 The Penn Center on St Helena Island SC is still very much alive today and worth a visit.